There are certain bars that seem perfectly suited to drinking whiskey. Some are rich with mahogany and leather, the kind of place you’d want to light up a cigar; others, relaxed and easy, with something of a julep-on-the-porch, laid-back Southern vibe. 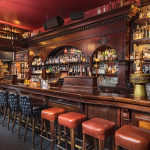 But it’s hard to compete with a legitimate saloon as a whiskey bar.Elixir, in San Francisco, has been a continuously operating bar since 1858, making it the city’s second-oldest. (Rebuilt after the great fire of 1906, it then survived Prohibition as a “soda fountain.”) Its Victorian heritage is palpable. And it’s a veteran bar in another sense, too. Under the ownership of H. Joseph Ehrmann (better known, to everyone, as H.) for the last fifteen years, it was at the forefront of San Francisco’s craft cocktail revival. Today it’s a city mainstay, a comfortable spot for an afternoon beer, an elaborate evening cocktail, or—always—an interesting whiskey. Ehrmann estimates that the groaning shelves of Elixir hold around 250 bottles of American whiskey alone. A huge proponent of private barrel selections, Ehrmann offers quite a few at any given time: Currently, Elixir has seven of their own private barrels in rotation; limited supplies of another six past barrels; and eight bottles from private barrels of other bars. Follow it up with Elixir’s signature Boot Black Stout—made for the bar by local favorite Standard Deviant Brewing—and you have yourself an evening. The post Where to Drink: San Francisco’s Elixir Bar, Open Since 1858 appeared first on The Bourbon Review.